Making Thai dishes at home couldn't be easier now that you can buy the necessary ingredients at Waitrose. 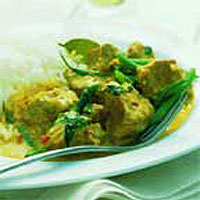 Try this gently spiced pork curry for a warming family meal. Heat the oil in a large pan, add the curry paste, ginger and garlic. Fry gently for 2 minutes. Stir in the turmeric, then add the pork and stir until coated in the spices. Pour in the stock, sugar, fish sauce and lime leaves or zest and juice. Bring to the boil, then cover and simmer for 40-45 minutes, until the pork is tender. Taste and season if necessary. Cook the beans in boiling water for 5 minutes, then drain and refresh under running cold water. Add the green beans and coconut cream to the curry and stir. Bring to the boil gently, then simmer for 5 minutes. Stir in the basil leaves and serve with Thai fragrant rice. Use diced beef or chunks of chicken as an alternative. Try a glass of cold Thai Singha Beer.